Google Earth view of the Hexie Mountains, showing the numerous tunnels, shafts, drifts and prospect holes in the Gold Coin Claim area. "MINES. The mountain slopes in front and to your left (north) are honeycombed with tunnels and shafts dug by miners of gold and other precious metals. There was extensive mining activity throughout the area (Joshua Tree National Park) during the late 1800’s and early 1900’s. Very few of the mines were profitable due to limited high-grade ore; the Lost Horse Mine is one of the exceptions. Gold, silver, copper, lead, and other metals of economic importance are believed to be deposited when intruding magma cools and crystallizes, and various gasses and liquid solutions rise from the magma. As these move upward through the rock they cool and deposit dissolved material along the way. This deposition usually occurred in pre-existing fractures or fissures, resulting in a limited vein of the metal. Quartz is often associated with these veins and is an indication of possible valuable deposits. Shafts and tunnels part way up the slope to the east are probably on smaller branches of the fault zone along which quartz veins formation has occurred." I remember visiting this area when I was a kid and how excited I was to get out of the car, climb the hills and explore the tunnels and drifts that dot the slopes of the Hexie Mountains. And now, many years later, it’s still the same. Even though I know hundreds of people have explored these old mines, places like this seem to renew that sense of adventure and discovery I've had since I was a boy. And that motivates me to hike the trails, climb the mountains and explore the backcountries. The gold I find today is the scenery and historic spots and the pictures I take. 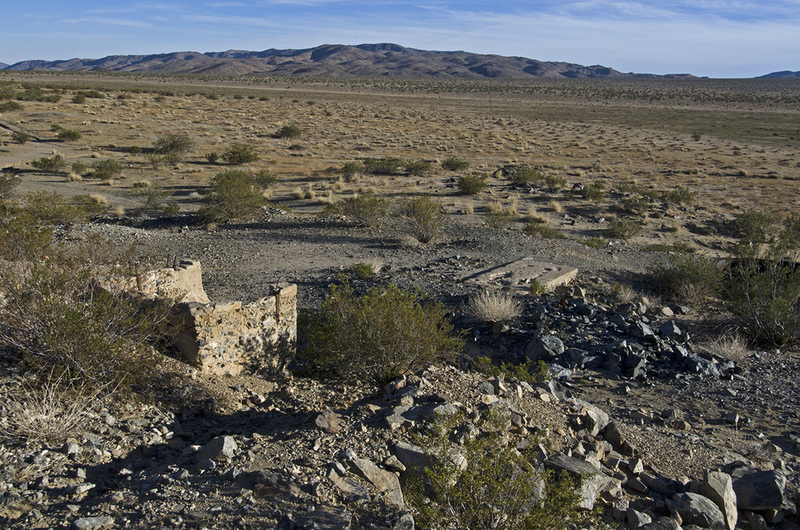 Information regarding these mines (and most of the mines in J Tree), their discovery, location, production, owners and the mill once located here is very scanty. One source states that the Gold Galena (aka Gold Coin) mine was discovered about 1900 and was operated by the German-American Mining and Milling Company in the early 1900s. A Mrs. Stead claimed that she and her husband owned and worked the Gold Coin in 1911. They lived at the mine and hauled water from Pinyon Well, using barrels and a wagon. By 1916, the mine was owned by the Gold Galena Mining Company of Los Angeles. The workings ranged in depth from 70 to 100 feet on a vein containing galena carrying gold. By 1929 the Gold Coin Mine was owned by a man named Longnecker and was reported to have five claims. He reportedly had two men working at the site. The mill that was once located here was probably built in the 1930s, when there was a renewed interest in reworking old tailings in the monument. All that is left of it now are the concrete foundations, a few bits of timber and the two sheet-iron tanks which held either water or cyanide to process the ground up ore from the mill. And that is about the extent of the information I was able to gather regarding the mine and mill. But the real fun is in the exploring. I parked at the Pleasant Valley Backcountry Board and backtracked a bit to a couple of tailing piles I had just passed on the way in. After a quick look around there, I headed back to what are the most obvious signs of human activity at this stop, the two large metal tanks and mill foundations right near the backcountry board. The metal tanks apparently anger people, as they are full of bullet holes. 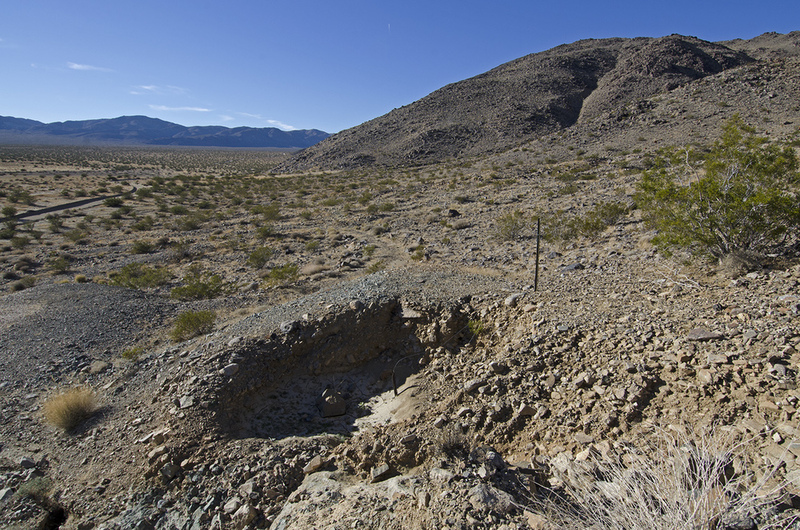 From the tanks, there is a shored wagon road that heads northeast to several exploratory holes on the side of the mountain. The various mine workings stretch about a half mile east-west and include eight inclined shafts, two vertical shafts and several shallow pits and cuts. I wandered around for a spell, hiking the old road up the hills and climbing to most of the workings. Several of the shafts have been walled shut, with cement and rocks. A few of the shallow ones were still open and I was able to peek into them a ways. I don't normally go into tunnels anymore, ever since the bat incident. I did climb into one and walked back a short distance, but all that remains to see today of the old mining days here are the crumbling remains of a lot of hard work. Building the road up the mountain, digging these tunnels and shafts, hauling up all the equipment that must have been used....I'm always amazed at the amount of work the lure of gold can create. And at the Gold Coin Mine, it was pretty much just the lure of gold that created all these workings, because the scanty records available have no information regarding the output of this mine. The only mention I could find was that the ore paid $12 to the ton, not a good return. After exploring most of the workings I could get to, I headed back down the road to see if I could find any evidence of where the miners may have lived while working at the Gold Coin. A short distance east of the mill ruins there is some level ground near the base of the hills, a perfect spot to build a cabin. I found a lot of old, rusted cans and what appeared to be several building foundations and the remains of a few stone walls. My guess is there were several stone cabins along the baseline of the hills. I wish I could find some pictures of what the place looked like back when the mine was operating. For now, I'm happy with the pictures I was able to take and the time I was able to spend here at the Gold Galena (Gold Coin) Mine.